In the center of a stone wall next to a pit, is a 10-foot wide opening that leads to a massive cavern, on either side of the opening are bas-reliefs, of women with spikes being driven through their bodies and their eyes while they burn themselves. Detect magic: 1st rd: magic is present here, 2nd rd: strongest magic radiates from the walls and the opening, 3rd rd: It radiates strong abjuration. In the center of the opening is dangerous pit trap. This trap is used not just to stop intruders but also to kill anyone who attempts to escape. It will trigger even if you fly over it, dropping the green slime on top of flyers. This leads from Area 2 into Area 4. This area is protected by a permanent teleport trap spell, with a destination of the prison room in Area 5. A single 5-foot square of green slime deals 1d6 points of Constitution damage per round while it devours flesh. 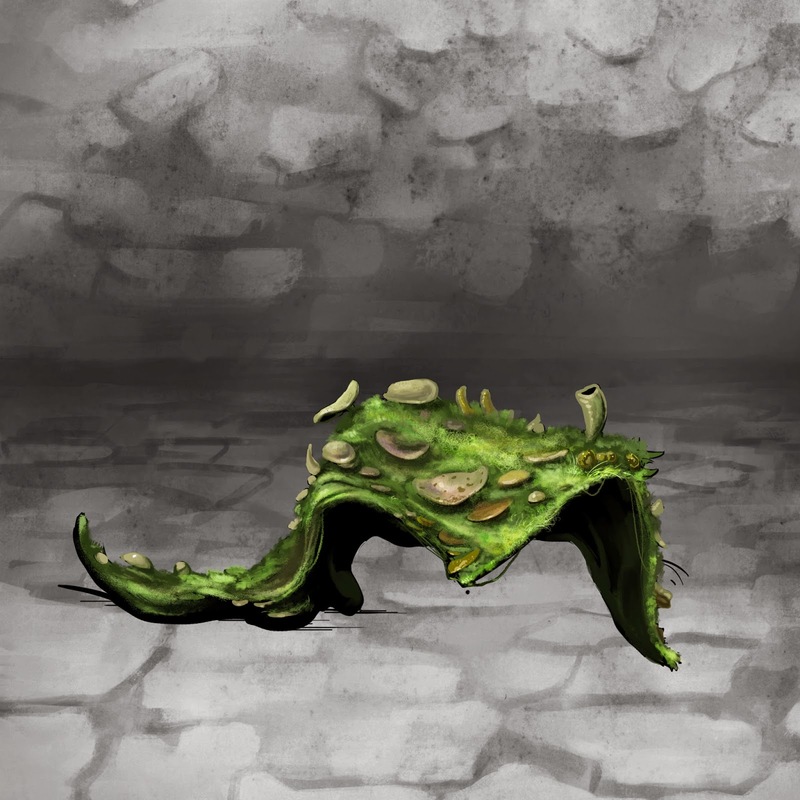 On the first round of contact, the slime can be scraped off a creature (destroying the scraping device), but after that it must be frozen, burned, or cut away (dealing damage to the victim as well). Anything that deals cold or fire damage, sunlight, or a remove disease spell destroys a patch of green slime. Against wood or metal, green slime deals 2d6 points of damage per round, ignoring metal's hardness but not that of wood. It does not harm stone. You can find the start of these encounters here in Area 1. A truly evil trap. But I guess you knew that already! Make the pit deeper, the detection and disable harder, make the spikes poisioned, let the slime fall, the have the trap door rest, which activates the teleportation circle at the bottom of the pit, and puts your back up at the top.....wash rinse repeat,....that's truly evil.